As a kid, I loathed pumpkin. I wasn’t a picky eater, I just thought that something as rotund and squashy as a pumpkin should be nowhere near my mouth. Also, if you gut and carve something to sit outside and be eaten alive by gnats for weeks, it generally isn’t automatically associated as something I’d like in a pie. Just saying. I fondly remember Thanksgiving meals ending with pie. Frozen pie, but who really cares about what was homemade, what was frozen, and what is still kinda frozen on the left side after a huge meal? (Okay, I still do care. 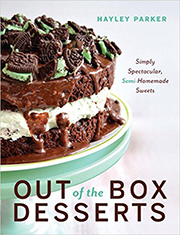 That’s why I’ve insisted on taking care of desserts for Thanksgiving for the past several years). Usually, my grandma would buy three kinds of pie: pumpkin, pecan, and key lime. Um, where is the apple? Banana cream? Strawberry? Throw me a bone here, grandma. This ain’t okay. 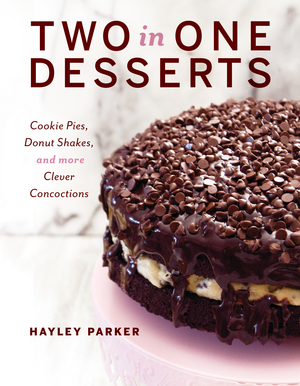 And as a kid, pecan looked like poop and key lime pie sounded about as appetizing as cheeseburger pie, which still doesn’t sound appetizing at all. I have problems with the idea of ground beef and ketchup inside of a casserole dish. Don’t ask. So I’d get pumpkin, ask my grandma for an extra-extra-extra dollop of Cool Whip (screw it, hand me the tub and a spoon), scrape the whipped cream off lick by lick, and then hand back the pie. No joke. Now, my tastes are more acquired and mature. I can handle the relationship between limes and pies, and I can get behind eating squash guts in a morbid-sorta way. Still shudder at cheeseburger pie, but that’s another story, y’all. Pumpkin pie. It’s quintessential fall food, isn’t it? Spicy, rich, and comforting. 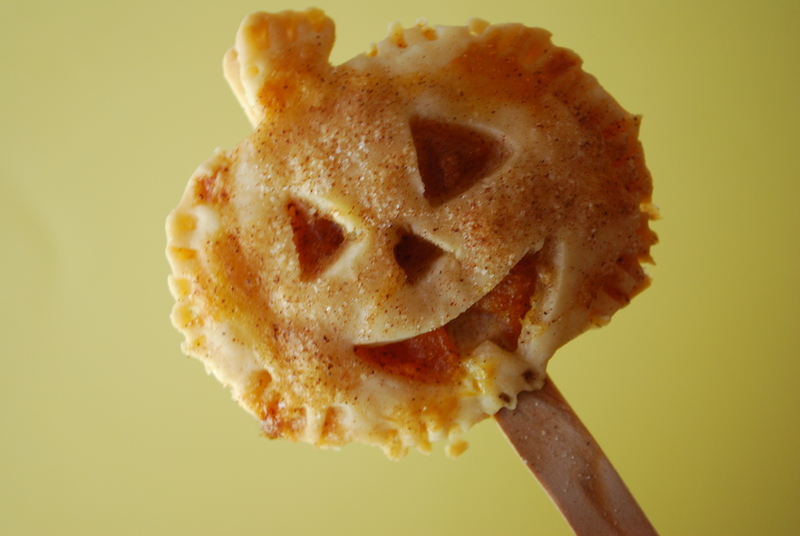 And for these Pumpkin Pie Pops, easy and adorable! These pops are equal parts tasty and cute. They’re simple to make and are fun little gifts for neighbors, coworkers, classmates, friends, or your mouth. I mean, really. The idea is not new and a bajillion blogs have done their versions of this easy pop, but I wanted to make my own. For this, I made both pops AND pockets so I could have options. People like options. For these, I closely followed THIS version by Miss Make. Enjoy! 2. In a large bowl, mix together the pumpkin, sugar, butter, 2 tsp egg, vanilla and spices until blended. 3. Gently roll out a pie crust. Cut pumpkins using a pumpkin shaped cookie cutter. If desired, cut out faces with a small sharp paring knife (be careful!). Make sure you have an equal amount of pumpkins as you’ll need two (back and a front) to form the pop/pockets. 4. Lay a pumpkin down on the prepared baking pan. Top with a teaspoon of mixture in the center, then gently press a popsicle stick into the mixture. Top the mixture with a second pumpkin (if you’re making faces, use those). Carefully press the edges of the pumpkins to seal. Crimp with a fork if desired. Repeat process. 5. If you’re just making pockets, repeat the same process minus the popsicle stick (obvi). 6. Very gently brush the pops/packets with the remaining egg, careful not to smear the pumpkin faces. Sprinkle with remaining cinnamon sugar. 7. Bake for approx. 16-19 minutes or until golden. Allow to cool several minutes before serving. They’re best eaten the same day, but store airtight in a paper bag up to 1-2 days if desired. I mean, how cute are these pops!? It’s so fun trying to make their different little faces. And the sad guy, anxious to be snacked on. And the pockets! These. Are. Amazing. Super cute!! I hope you enjoy!! These are adorable and would go over really well here at Thanksgiving next month. Thanks! Your version is adorable!!! I’d much rather eat these than pumpkin pie! Love pumpkin but hate it in pie. Growing up we always had the bland store bought pie, which for me, was simply a way to eat a ton of Cool Whip! My mom always burnt her pecan pie so I didn’t really develop a love for that either! Maybe you could pecan pie pops too! I teach Kindergarten girls at church on Wednesday evening and these would be a perfect snack idea for them! 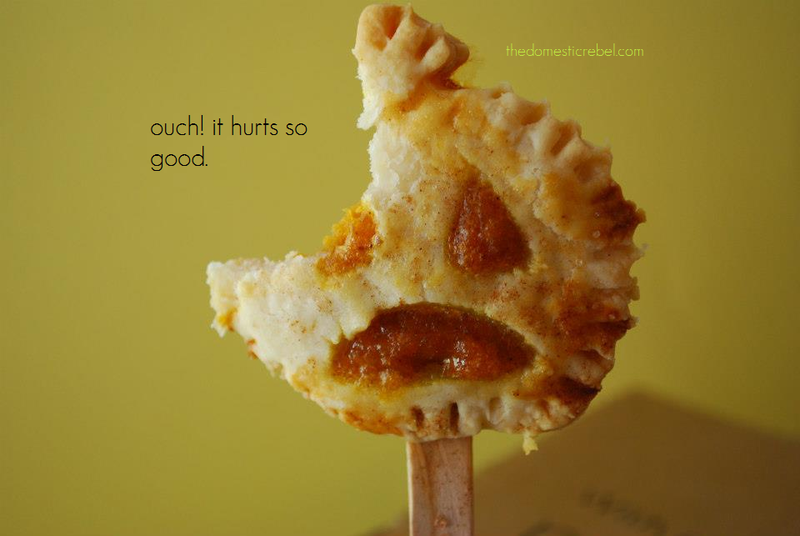 I am not a fan of frozen pies….fresh is always so much better. I make a fantastic apple crumb pie with a homemade pie crust that I get requests for every year. I have tried making something different and it usually leads to sad faces because I didn’t make the apple pie. My grandma is the queen of pies though. Every year her table is full of homemade pumpkin, lemon meringue, coconut cream, and apple pie….I always try to convince her to skip the meal and go straight for the dessert. Pumpkin Pie. My favorite dessert ever next to oatmeal raisin cookies. Love the little mini version!! 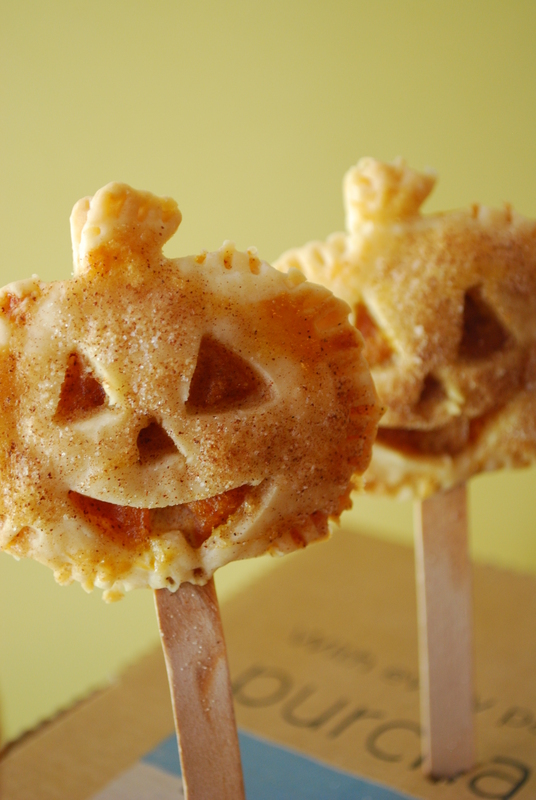 And as pie pops. These remind me of Ashton’s brownie pops! Oh and when I say I love pumpkin pie I mean I love a plate of cool whip with some pumpkin pie. Adorable!! Love the little faces. My family’s pie situation is ridiculous. There would be like 8 of us, and my gma would have 12 pies. WHY she thought we all needed a pie and a half, I have no idea. I pretty much hate all pies, but I can handle apple. 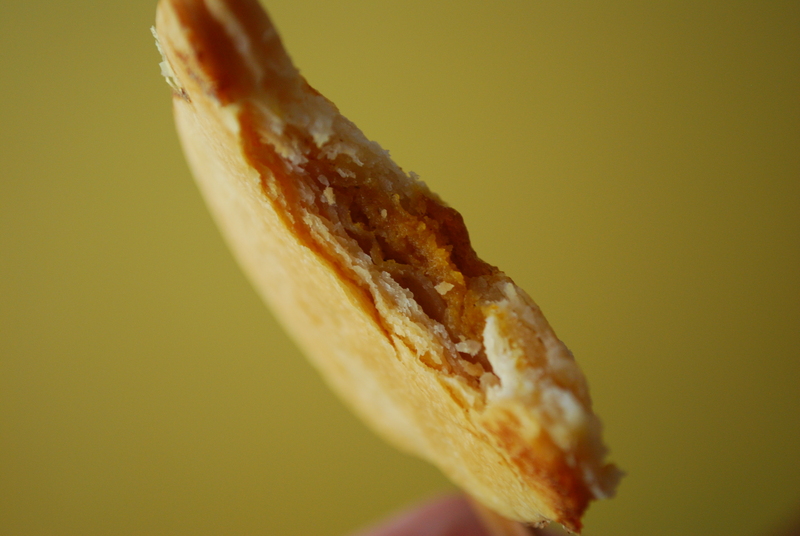 Kie Lime (imo) is NOT pie, it’s heaven!!! My fave thing evahh. Hahaha I have yet to try key lime pie actually. Usually, my grandma buys it for my uncle because it’s his fave, and now that I’m in charge of the rest of the pies, I’m usually just feeding my sugar coma in an apple pie. I’ll have to swipe some key lime this time though, you know, for research. oh you must, especially if it’s a GOOD key lime pie. I’ve had some really bad ones! I love pumpkin pie…that is piled high with tons of cool whip!!!! 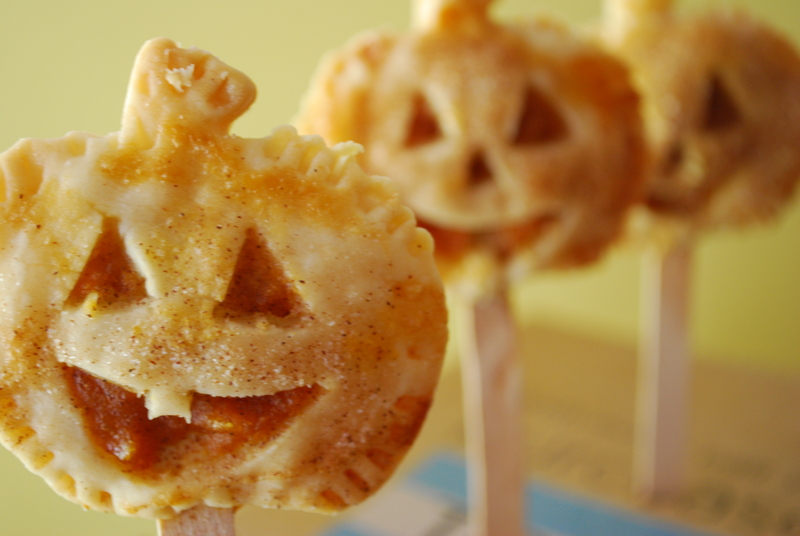 I love these cute little pumpkin pops. Their faces are just too adorable!!!! These are adorable Hayley! And I am a lover of all things pumpkin. Plus Coolwhip. Love the pockets and pops version. You’re so flexible, hehee!! These are just too freaking cute! I can’t wait to make these for my niece and nephews! Pumpkin pie is actually my favorite (apple and pecan run close seconds). And these? Mini ones on a stick? Soooo, soooo cute! Plus, I can get Doodle to eat just about anything if it’s on a stick, haha! I know! He didn’t deserve it, not one bit 🙁 lol, thanks Karyn! These are absolutely adorable! 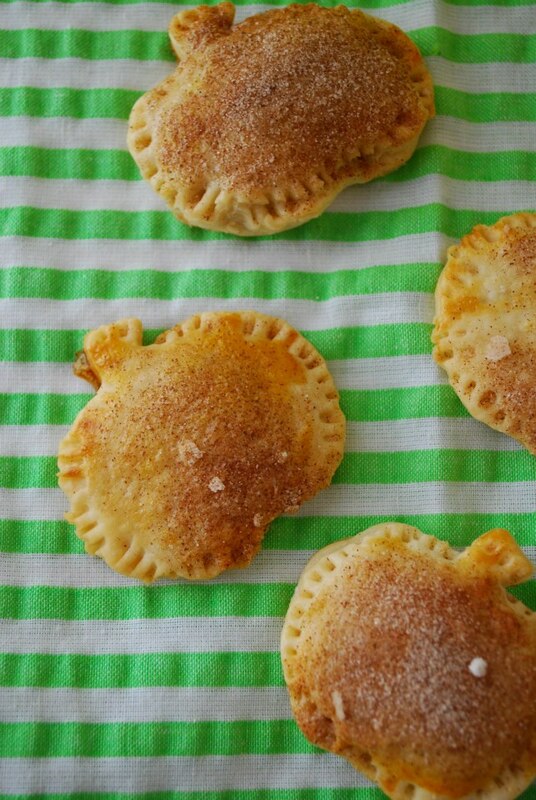 I’m not much of a pumpkin pie eater but I think these would be perfect! A little pumpkin and a lotta crust. Perfect! I’ve never seen a pie pop before! Love it and since I love pumpkin – and lots of crust this will be perfect. Especially with a cool whip top hat. I’m pinning this so when Rocket is old enough we can do it together – in the mean time, I’ll practice on my family this Thanksgiving. omg, these are too cute, they literally brought a smile to my face when i saw them in my reader!! I’m hosting a fall themed blog hop and would love it if you linked them up! I can’t wait to make these for the kids. Thanks for sharing your idea. Wow, I’d love to make these for Halloween. 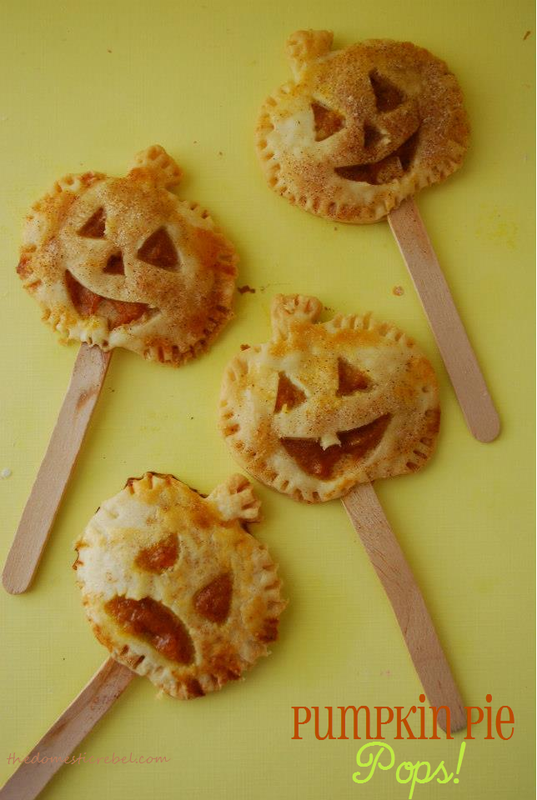 But I suspect I’d be the only one who would eat them (my kids wouldn’t eat pumpkin pie, even if they were as cute as these little pops). These are the cutest Fall goodies I can remember seeing. 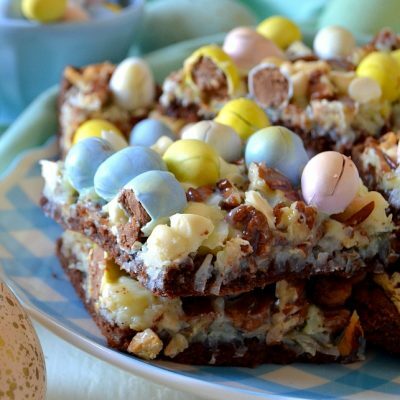 Yum and so fun! These are all sorts of adorable! They look like they take some time and patience but well worth it I’m sure!